How can you plant a pretty garden around an ugly eyesore? You can either cover it up, divert attention to another area, or in the case of my new apartment planting; make it into a focal point! An ugly tin maintenance shed barges into my planting area like an uninvited guest, jutting out as if by accident. 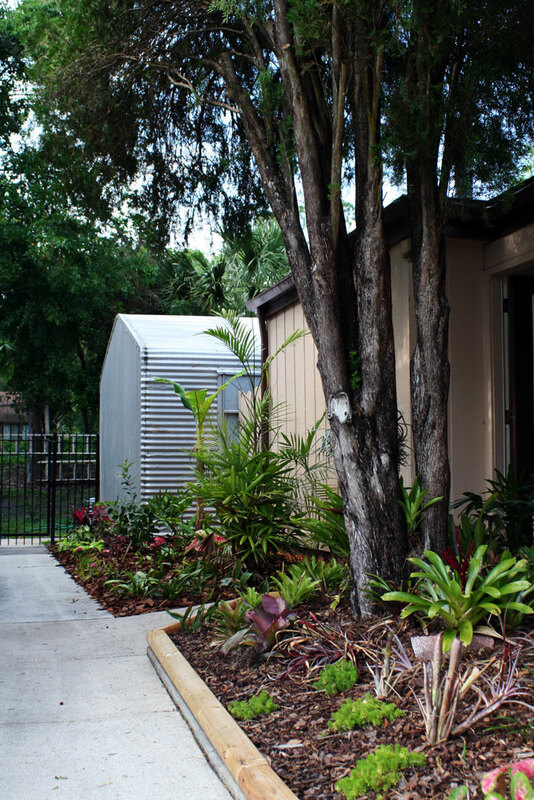 By adding a medley of bright and architectural foliage plants, however, the shed has become the main attraction. 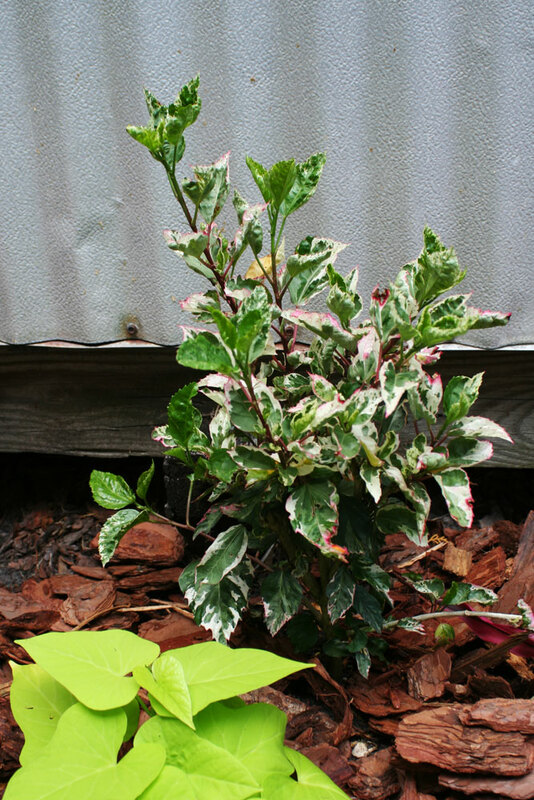 Playing off the modern look of a corrugated tin background, I decided to let bright pink ti plants and hibiscus hybrids show off interesting pink and white leaves. 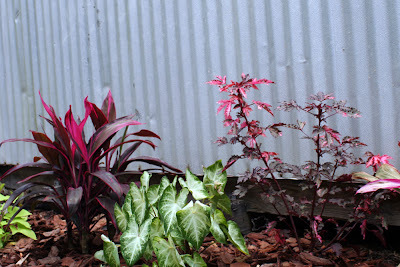 They will eventually grow straight up, (I will stake the hibiscus) staying off the path and against the silver toned wall. For the middle layer I planted sage green and white 'Aaron' caladiums for a pop of contrast, and some Alocasia 'California' elephant ear rhizomes to echo the plantings around the rest of the garden. They grow upright and will help hide the shed's foundation. Beneath these plantings are pink pentas and chartreuse sweet potato vine. The sweet potato vine brightens the edge of the path, spreading its electric leaves throughout the gaps while the garden fills in. 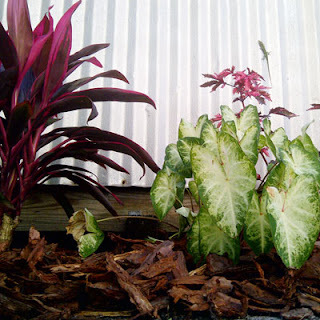 In the corner to the right of the shed, I've planted other bold tropicals; split leaf philodendron, California elephant ear and ice cream banana. These will soften the 'jutting' effect of the shed and create a rich and jungly feel, but to keep it from being too dense I've allowed at least a foot between the wall of the laundry room for easy access. It might not look like much now since many of the ti plants are just canes and the Alocasias are still underground, but once the plantings fill in I'll be sure to give a progress report! Snowflake hibiscus could be grown for the foliage alone! 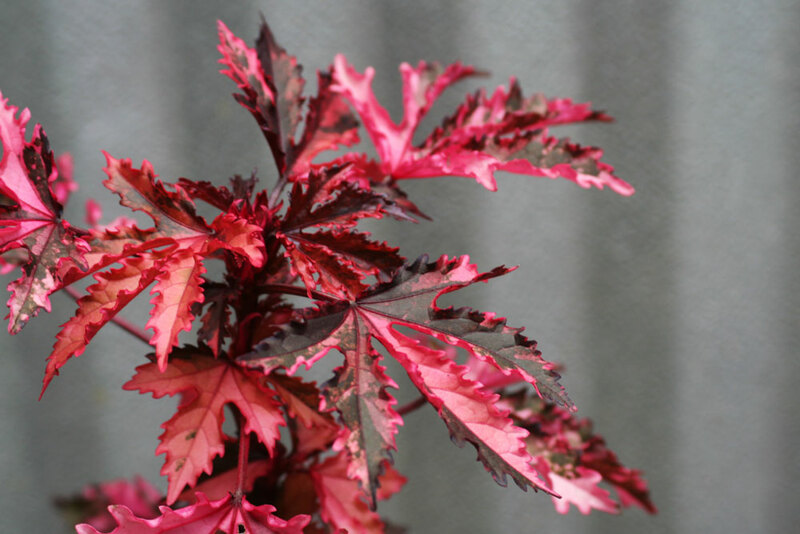 Hibiscus acetosella 'Haight Ashbury's intricate leaves stand out against the tin background. 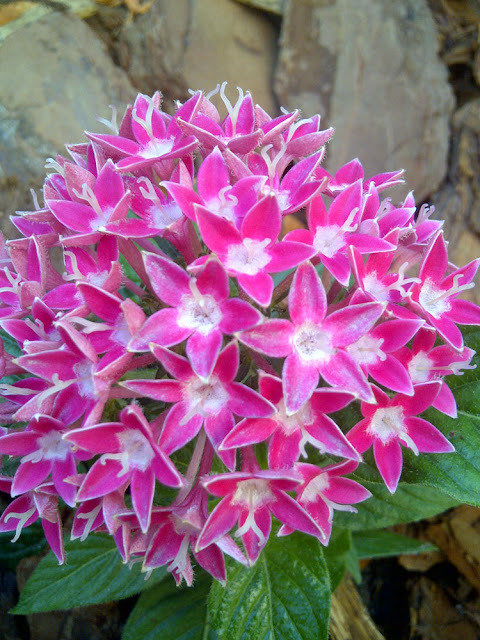 Pink pentas are the flowers in a foliage dominated planting. With the exception of the hibiscus. It isn't a garden until a lizard's moved in. How I wish you were my neighbor! I thought of your aesthetic when I saw the tin shed! The neighbors thankfully love the garden and ask me lots of questions. It's a win-win! Nice effect, especially to come as things fill in. Please give updates. I used to fight things like tin, or anything industrial. But now I think that is working against gravity in many cases. 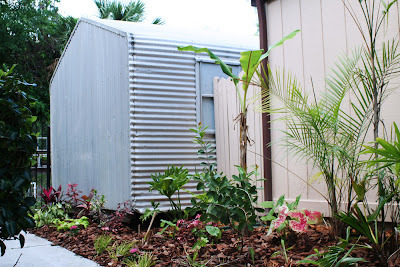 Tin = no termite damage or rot like a wood shed, so may as well go for it! I recently acquired some old roofing and put it against my back fence. at first I thought it might look bad, but it has grown on me. you have done a wonderful job of choosing the right plants - it looks lovely now and will continue to get better and better. Pentas attract butterflies. Good Job. WOW! I hope to see pictures when it fills in! 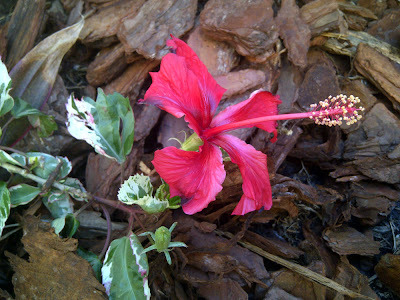 This looks like it will be beautiful with the large bright hibiscus all over! 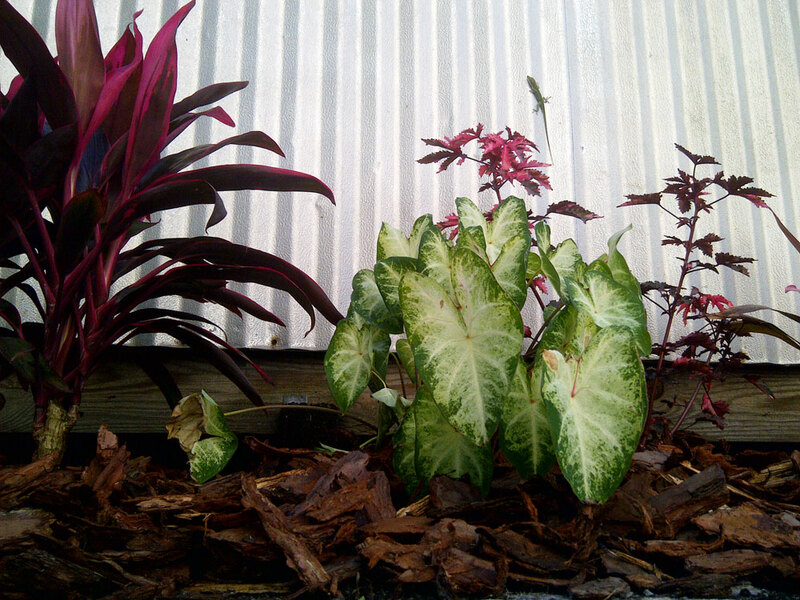 Gorgeous plant choices and I can already envision how exciting the garden will look soon. No one will even notice the shed..haha! 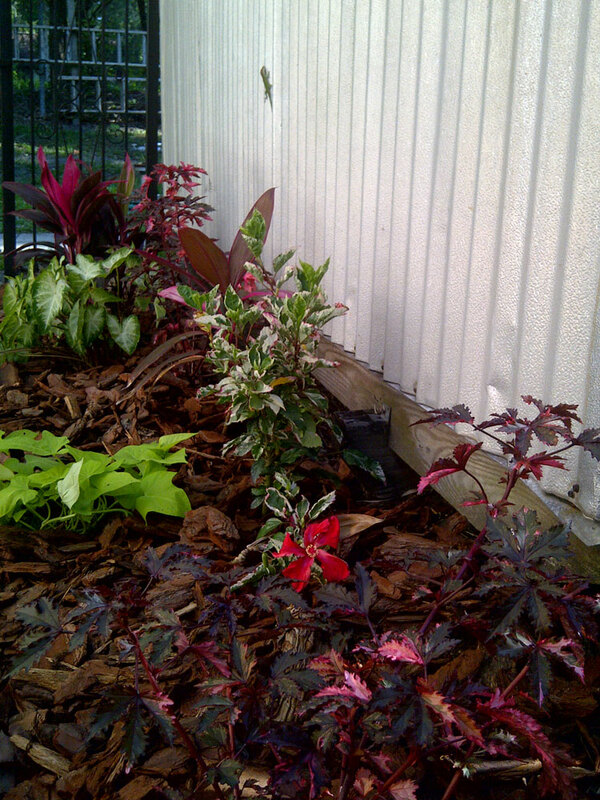 Nice selections of plants...can't wait to see photos of this area later this summer. It should be wonderful!